In this post we’ll explore the benefits of using different types of video technology to give your landing pages a conversion lift. We’ll also discuss how changing the video script, presenters and position of a Video Spokesperson on a page gave a 12.5% increase in leads. 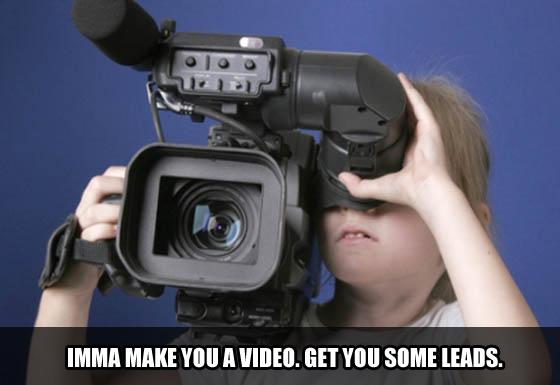 Anyone can produce videos these days. However, there is a big difference between useful video and useless video. Just don’t get your 8 yr old to shoot it, in other words. The first rule is to actually use a video, but there are different kinds and one of them is commonly known as a web presenter or video spokesperson, the other being the traditional videos we’re used to seeing. What’s a Web Presenter? Web presenters are an instantly engaging way to hold a visitors attention. The technology allows you to have a friendly face ready to welcome visitors to your landing page, and as this technology is relatively unusual, it’s impact is more immediate. Write a script appropriate to your audience and your goals. Your script should be written in clear and accessible language and it should be to the point. They can present the call to action to your visitor in a far more convincing way than a button can! If you don’t believe me, A/B test it! Your choice of presenter will depend on a combination of factors including who your target audience is and what product or service you are selling. Your presenter is effectively the face of your business at that moment in time and so you need to choose someone who you feel represents you best. This is also incredibly important. We had a a situation recently where the CEO of a client company insisted on using their own script, choosing their own presenter and determining themselves the placement of the web presenter on the page. The result was a 10% drop in the leads coming from the homepage. The client came back to us obviously very disappointed. We therefore deconstructed the various elements of the video – script, presenter, placement and how all of these contributed to a clear and fitting message for the company. We then wrote a new (tougher and punchier) script, changed the presenter and also amended the placement of the presenter on the landing page. The result was that they have now seen a 12.5% increase in leads from the homepage and a 2.5% increase in direct sales from the homepage. The message here is while it’s commonly known that video can lift conversions, it needn’t be just any kind of video. The best placement on a page will depend on the design and layout of your page. You do not want a video to distract the viewer from the call to action of the page; you want the web presenter to compliment it and point the user to it (sometimes literally). A closer half body or headshot can be more personable as it feels like the presenter is closer to you and talking directly to you. However – if you want to display/show something on the page then a full body shot can be beneficial as it gives a sense that nothing is hidden. OK, back to regular video. 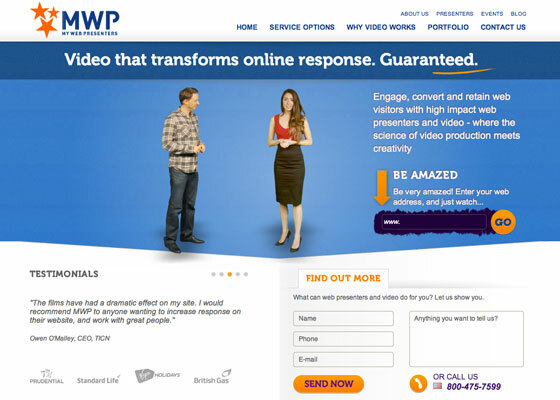 What are the different ways you can use video to improve your landing pages? Your choice will depend on your business goals. Video testimonials are a great way to harness the power of word of mouth – it can be extremely persuasive to see people just like us professing the benefits of something we think we might need. Video testimonials will give you credibility and inspire trust. reviews and product demonstrations show the visitor exactly what they are looking getting, in the context within which it will be used. Secondly, there is a degree of transparency in demonstrating your product – the video will answer a lot of the visitors questions quickly which will help the viewer trust you and could prevent any delay in their decision to complete a purchase or other call to action. Interviews with CEO’s or other important figures in your company make you appear credible to your visitors. The personal element of an interview will create trust and evoke an emotional response. Issue-based videos that tackle a general industry question or problem are a great way to reach a large audience and to drive visitors towards your own website. These types of videos will serve you best if they are placed on a video sharing site like YouTube or VIMEO (as well as your own website). As well as potentially driving traffic towards your own website, these videos are useful for raising an awareness of your brand in your industry. Especially if you are introducing visitors to an unfamiliar concept, this type of video will make a massive difference to your bounce rate. A simple and clear explanation of your product or service might be the best way that you could use video to your advantage. 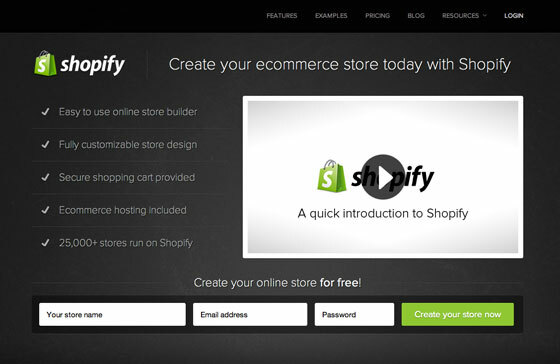 Shopify obviously saw the benefit and have used video on one of their landing pages to explain what they do. Notice the simplicity of the design and layout of this page. Finally, if you do the sensible thing and use video on your landing page, make sure that you actually embed it. This way, your visitor will be able to complete other actions on the page while the video is still running, e.g. sign up to your mailing list.